Give me champagne, wine or vodka – anything else I usually refuse – until now. Oh man… I’ve had people try and convince me before, a total good-time-girl at heart, I always go along with it and happily shoot my shot, “Bottom’s Up!” Then I pray no one notices the horrified face I make as I employ all my throat muscles (that are now on fire) to push this molten hot liquid down the rest of the way till it falls in my stomach and continues to ignite my insides. I have never been so happy to be wrong! Fireball Whiskey – I love you! You go down dangerously smooth and make my insides warm rather singed. You don’t taste like Whiskey – you taste like delicious Big Red bubble gum! After my initial shock of actually really liking this, I had resigned myself to thinking this must be a “total chick’s whiskey.” One that a real-whiskey-drinking-man would view as “the wine cooler” or “malibu rum” of whiskeys. So who better to test it on than my husband, a real-whiskey-drinking-kind-of-man! I was sure he’d hate it, but none the less shared my excitement about it with him. I must have made an impression because the next day I came home from work to a full bottle sitting the counter and my hubby ready to put my claims to the test. So, here I go again, hoping I wasn’t just so drunk off my wine that night that I was wrong about it being so tasty. Nope! Just as tasty and I remembered! I am all about THE VOICE!! Despite being ridiculously tired of Christina’s gratuitous cleavage – This is my absolute favorite of the vocal competition shows! This is my favorite because it is quite simply the best. I was into American Idol in the beginning – but grew tired of the constant bickering between the self-important judges all shamelessly fighting for more air time than the actual contestants. And X Factor I enjoyed for a few weeks then eventually tired of as well. The Voice is the only one that can hold my attention and keep me entertained as well as inspired! If you’re not yet watching – it’s not too late to jump in. So far the “blind auditions,” have concluded, but the best is yet to come! The Battle Rounds start next and I’m so excited! The blind auditions are great because you connect with the artists and can appreciate their vocal abilities and learn more about their “stories” – some of which will make you cry no matter how tough you are. The Battle Rounds are where you see these artists fight for their lives in the competition, leave it all on the stage and give everything they’ve got. I really can’t say enough about how great this show is and how much better it is than the others! A very thin woman once said, “nothing tastes as good as skinny feels,” while I refer to this tenant when dieting – I am fairly certain this woman never had a brownie sundae. 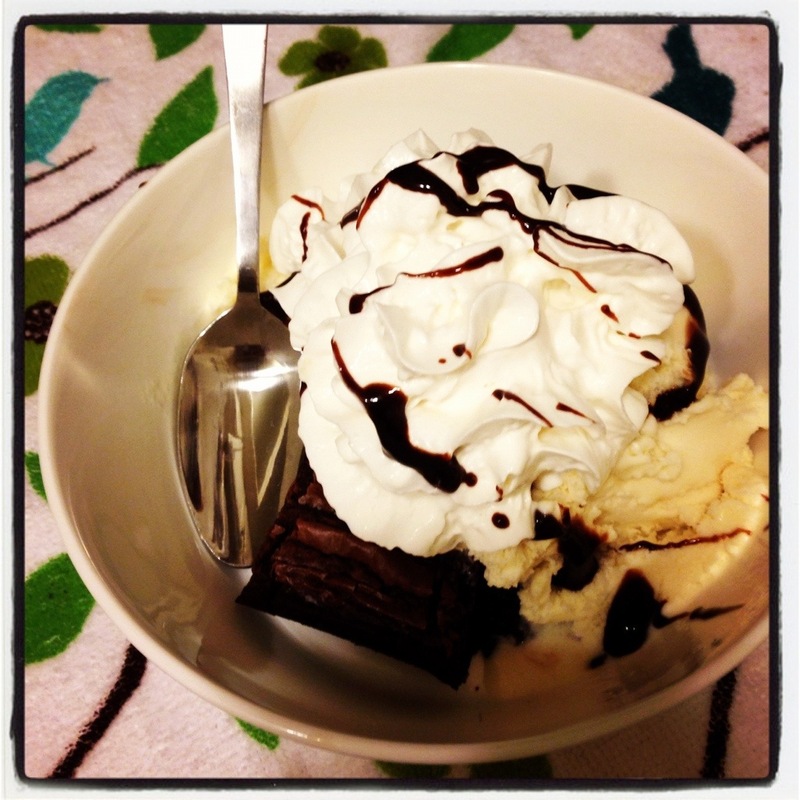 The only reason to eat dinner is to get to dessert and brownie sundaes are my favorite! The most important factor in making a proper brownie sundae is the brownie – simply it needs to be warm and nutless! Then a delicious vanilla, fudge and whipped cream!! This is the little gem I made for myself last night! BB cream has been my new beauty obsession of 2012 since my bff/beauty & fashion guru/author of AshnFashn.com introduced me to it. My other bff, the hilarious and talented casting genius/author of the extremely amusing and boisterously merry rants at EwRewd.com, refers to me as “the Bee” hence the title of this post. I like alliterations. BB Cream is a cosmetic staple that used to be sold mostly in East and Southeast Asia, but (fortunately for us!) is rapidly making it’s presence known in the Western beauty industry! BB Cream stands for “blemish balm” in most of the Asian markets, but here in America we know it as “Beauty Balm” because the word “beauty” is easier to market and sell than the word “blemish!” Just my guess, of course. This cream is a girl’s new best friend – that will never talk about you behind your back! It’s the hardest working beauty product on the shelves and you won’t regret adding it to your morning beauty routine. You could see it as just another tinted moisturizer, but then you’d be selling this little wonder product short! BB cream is a one-stop-shop facial cosmetic product to replace serum, moisturizer, primer, foundation, and sunblock! So in addition to enjoying your sparkly new skin – you can enjoy less clutter in your medi cabinet and throw all those other bottles in the gar-bage! Bah-bye!! And just when you thought it couldn’t get better – it does. That is the wonder of BB cream. Not only does it moisturize, protect you from harmful UV rays and provide enough coverage to give your skin a natural glow – it has other benefits too. It doesn’t merely cover blemishes – it also treats them! Yup! Spread BB cream on your face and watch as it goes to work fighting blemishes such as acne, sun spots and age spots. And with anti-wrinkle, anti-inflammatory and soothing effects – why have you not clicked on the link below and bought one for yourself yet?! This product is amazing and you can tell I am a BIG fan. I love the light and fresh feel without having to wear make up everyday – it’s a huge bonus and a wonderful thing you can do for your skin. There are many manufactures of BB cream, but my favorite so far is the Garnier version (see below). I opt for the Medium/Deep variation because in the battle of my gene pool – the Native American side won over the Dutch side so I need the darker option, but for you little light skinned belles out there they have a lighter shade as well that might be best for you. I hope you love this product as much as I do! While I am by no means an IT wiz kid I am most definitely an apple girl. I love to have the latest and greatest in gadgets, but this is a small window of opportunity to try and attain this day in age. One reserved for the die hard chic geeks out there with limitless budgets, which I am not. To top it off this expensive window is only available for about 6 months and then you’re “so last season” – so, you snooze you loose. I usually snooze… but not this time! There are few things I hate more in life than lines – but apparently I was able to find something: phone ridicule. So, for the first time in my life I waited in line for a phone – but not just any phone, the iPhone 5. Gasp! Well you would too if you were rocking a 3GS still like I was! Whatever… I didn’t want to waste my upgrade on a 4s. So I am loving having the 5, but not as much for the technical upgrades, instead for an entirely different reason. My fingers happily prance around the screen of my new phone because after a year of being shamed by coworkers and curious onlookers whenever using my 3GS I can finally avoid phone shame. Hallelujah. My favorite features so far are the turn by turn directions (so long garmins of the world!) and facetime because I can facetime with my little niece Lila, although she is far less impressed with seeing me in her mom’s phone than she is when Facetiming with Elmo. So our facetime chat’s have evolved to me reducing myself to making funny faces at her. Anything for a cheap laugh! The things I do for that little peanut!